Even as a fluent French speaker I have never been able to completely bridge the cultural gap. The French have remained very traditional in their every day tastes.This is their charm, of course, and if you’re looking for authentic frenchness you don’t have to look far….. but if you’re looking for anything contemporary or non-conformist it will be a struggle. I’ve listed a few of the differences I’ve observed over the years regarding weddings. 1- The groom often arrives with his mother ceremoniously down the aisle. He then shows her to her seat and takes his place with the celebrant (or curate) . 2- They hardly ever chose the music for their ceremony. This is often left to the celebrant. 3- The choice of readings is also often left to the celebrant. 4- Weddings are only ever held on a Saturday. 6- The symbolic ceremony is held immediately after the civil ceremony at the Mairie and the bride often mingles with the guests before the ceremony. 7- The guests are all invited to the civil marriage at the Mairie so they all arrive together at the symbolic ceremony.In fact it is can be a public affair where anyone can attend. 8- The elected members of the council,above all, the Maire are often invited to the champagne reception. 9- The dinner in the evening is for close friends and family only. 10- Dinner and the decoration is very traditional. 11- I have never seen many flowers, but a great deal of attention is focused on the table settings, chairs and general decor which is always chintz! 12- Dinner never begins before 21h and often is still being served at midnight! 13- There is seldom live music in the evening (usually preferring a disco) but if so the bands are often expected to play until 3am or later. 14- The rings are always presented to the couple tied to a small ornate cushion. 15- There is often a dress code. This can be very interesting. Almost fancy dress. 16- French guests very often wear black to a wedding. 17- Ladies are always expected to wear a dress or a skirt. 18- Brides’maids and groomsmen are not a huge feature often being completely absent. 1- The groom awaits his bride at the top of the aisle wih his best man and the celebrant. 2- A huge amount of importance is placed on the choice of music throughout the ceremony. Very often this is played live. 4- Both civil and symbolic ceremony can be held any day of the week. 5- There are fewer and fewer Christian ceremonies being performed in non-catholic countries. 6- The bride always remains out of site until her entrance down the aisle with her father (brother,mother or any person of her choice). 7- Only close family and friends are generally invited to the civil ceremony and champagne reception? 8- The ceremony is usually a private affair for known guests. It is not open to the public. 9- The evening party is often open to lesser friends or aquaintances. 10- The evening meal can be a very informal buffet or a formal sit down meal.There is a huge variety of formulas. I’ve seen quite a few pic-nic weddings where everyone just brought their own picnic! Very cool idea with minimum stress. Everyone even bringing their own champagne! 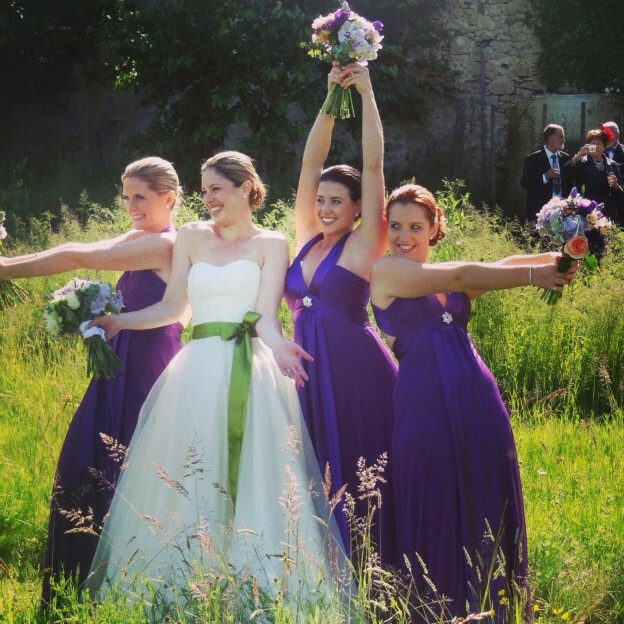 11- Flowers are always a hugely important part of an Anglo wedding. They are everywhere. 12- Dinner begins early. Often at 18h and finishes early. 13- Live musicians much prefer to play for a non-French wedding, often refusing to play beyond midnight.The disco then takes over. 14- The rings are usually presented in a box. 17- Ladies often wear trousers. 18- Brides’s maids and groomsmen are generally carefully chosen to help the couple. Very often enormous effort and expense goes into chosing their outfits.